Several large scale redevelopment/revitalization plans in Northern VA will kick into high gear in 2016. All three areas featured below are large, complex mixed-use sites that include multiple planning goals, require significant rezoning actions, and involve extensive community input – resulting in a multi-year approval process for all of them. And where will housing fit into this future development? These redevelopments take place within the framework of last year’s local election campaigns that highlighted the persistence of lagging economies, the escalating cost of housing, growing poverty in the suburbs, and the question of where our jobs will sleep at night. As we monitor these developments, we’ll being watching to see if and how the campaign rhetoric translates into places that are affordable, accessible and walkable, with a mix of uses and amenities that can be enjoyed by all in the community. In Alexandria: Old Town North (OTN) Small Area Plan (SAP) will update the older 1992 Old Town North Small Area Plan. Located in the northeastern part of the city, Old Town North is bordered by the Potomac River to the east, Oronoco Street to the south, the southern end of Daingerfield Island to the north, and Washington Street to the west. With preliminary staff work and technical analysis completed in 2015, the bulk of 2016 will be spent on the planning process for this area and civic engagement. The recommendations for the SAP will be informed by existing City plans – the 1974 Master Plan and the Plan for the Redevelopment of the Alexandria Waterfront. The goals are to create a sense of place with innovative architecture, design and open space, while respecting existing residential neighborhoods. The plan will maintain views of the river and ensure public access to water activities, and promote walkability and accessibility to open space. The work plan schedule anticipates adopting a final plan for the area in Feb, 2017. Regarding housing, there are 340 committed, affordable public housing units owned by Alexandria Redevelopment and Housing Authority (ARHA) in OTN. There are no market-affordable units nor are there any affordable rental set-aside units from market-rate developers located in this study area. What to look for: How proactive will the City be in promoting more housing that’s affordable and accessible? Which tools will be used to achieve the housing goals identified in the city’s Housing Master Plan? What role will density play? Will the OTN community support the redevelopment of Hopkins-Tancil Courts and the Administrative Office Building for ARHA into higher density, mixed income developments? What role will the campaign commitment of the new Mayor to slow the pace of development play in the plans for OTN? In Arlington: The Lee Highway Briefing Book will examine existing conditions, plans and policies that affect the Lee Highway corridor between Rosslyn and East Falls Church in Arlington County. The study boundaries will include all land within ¼ mi of Lee Highway to the north and south, keeping neighborhood clusters intact and undisturbed. As there has been little planning done in the past for this area, the goal is to improve the corridor and address the growth and development pressure emanating from development nearby in the Rosslyn/Ballston corridor. The purpose of the briefing book is for data collection and research only; no redevelopment is planned at this time, but the hope is to ensure that future growth will be guided by a comprehensive vision for the corridor. 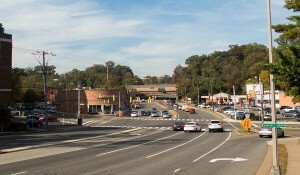 Since 2012, a coalition of civic association leaders known as the Lee Highway Alliance (LHA) has been actively engaged in conducting educational forums and walking tours – with technical assistance from County staff – with the ultimate goal of developing a community-based vision for the corridor. The result has been growing interest and involvement in the work of the LHA. Upon completion of the educational forums in June 2014, the LHA transitioned to a series of five meetings in the fall of 2014, and the briefing book provided context for the community discussions. The intent of those meetings was to share lessons learned and information gathered during the educational forums; and to begin to identify key issues, potential focus areas, and guiding principles for a re-visioning process. What to look for: How will the County’s need for more housing that’s affordable align with the visioning sessions led by the civic associations? As redevelopment occurs, will Arlington be successful in promoting the geographic dispersion of affordable housing in places like the Lee Highway corridor as is called for in the newly adopted Affordable Housing Master Plan? What are the challenges to providing additional housing posed by this narrowly defined commercial area abutting established single-family residential neighborhoods? 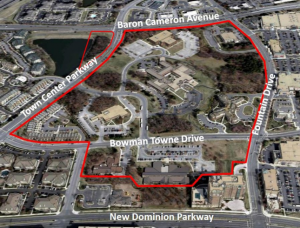 In Fairfax County: Reston Town Center North (RTCN) plans for the redevelopment of an approximately 49 acre area of irregularly shaped parcels, owned by Fairfax County and Inova Health Care Services, Inc., located north of Reston Town Center. The concept plan envisions creating eight block parcels with a grid of streets and a mix of uses “improving the current county services, integrating them into a new mixed-use community with housing, shops, restaurants and a publicly-accessible central green open space.” This redevelopment takes advantage of a number of large employers and retail and restaurant opportunities located there, as well as proximity to the future Reston Town Center metro station, creating additional opportunities to live/work/play in this popular and desirable location. 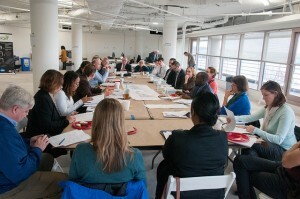 County leaders are working with the community to refine the county’s objectives for the site. In addition to redeveloping the existing county facilities, other possible public uses could include transitional housing for people moving out of the shelter, additional affordable housing, an indoor recreation center or swimming pool, a performing arts center, and community meeting rooms. Redevelopment plans will move forward in two phases. The first phase calls for the redevelopment of the 6.65 acres just south of Bowman Towne Drive where the library and shelter are currently located. These parcels, known as Blocks 7 and 8 (and owned by the county), are planned for mixed-use development that would include the proposed replacement library and shelter, as well as new affordable housing. The county will be seeking redevelopment partners for these block developments via the Public Private Educational Facilities and Infrastructure Act. The county and Inova will jointly pursue rezoning of the remaining parcels, and then negotiate a full development agreement for swapping land at the conclusion of the rezoning, building the common infrastructure, and establishing easements. Future development of individual blocks would require separate, subsequent rezoning actions. What to look for: Will the recent collapse of the Lake Anne redevelopment plan inform the county’s thinking with regard to selecting a development partner? Will the county use this opportunity to address stated goals in the Housing Blueprint, especially regarding permanent supportive housing and housing for families at lower income levels?